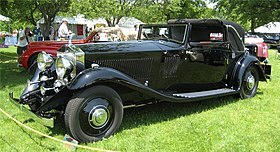 The Rolls-Royce Phantom II was the third and last of Rolls-Royce's 40/50 hp models, replacing the New Phantom in 1929. It used an improved version of the Phantom I engine in an all-new chassis. A "Continental" version, with a short wheelbase and stiffer springs, was offered. The Phantom II used a refinement of the Phantom I's 7.7 L (7,668 cc or 467.9 cu in) pushrod-OHV straight-6 engine with a new crossflow cylinder head. Unlike on previous 40/50 hp models, the engine was bolted directly to the 4-speed manual transmission. Synchromesh was added on gears 3 and 4 in 1932 and on gear 2 in 1935. Power was transmitted to the rear wheels using an open driveshaft, a hypoid bevel final drive, and Hotchkiss drive, replacing the torque tube from a remotely mounted gearbox used on earlier 40/50 hp models. The chassis of the Phantom II was completely new. The front axle was mounted on semi-elliptical leaf springs as on earlier 40/50 hp models, but the rear axle was now also mounted on semi-elliptical springs instead of cantilever springs. This, along with the drivetrain changes, allowed the frame to be lower than before, improving the handling. The 4-wheel servo-assisted brakes from the Phantom I were continued, and the Bijur centralized lubrication system from the Springfield-built Phantom I was included on all Phantom II chassis. Regarded as the two most important P-II Continentals are 20MS and 2SK, the only two P-II Continental Roadsters ever built. 20MS has been in a private Mid-Atlantic collection since 1989, 2SK, the Thrupp and Maberly Roadster once owned by Tyrone Power, was in the Fred Buess collection since 1958 but was sold at auction in 2010. Rolls-Royce Phantom II with All-Weather Cabriolet coachwork by Thrupp & Maberly for the Maharajah of Rajkot, Chassis #188PY (1934). This car also is known as the "Star of India". Only the chassis and mechanical parts were made by Rolls-Royce. The body was made and fitted by a coachbuilder selected by the owner. Some of the most famous coachbuilders who produced bodies for Rolls Royce cars are Park Ward, Thrupp & Maberly, Mulliner, Carlton, Henley, and Hooper. A remarkable survivor on display at the Technisches Museum, Sinsheim, Germany, is a 1933 Phantom II (see photo at right), which made its way to the Kenya Tea Company of British East Africa. As the rear wood section of the vehicle was heavily worn, a local shipwright, under the design guidance of Hooper of London, conceived and built a boat tail rear end. The car was donated to the museum in 1999 and has been on display since. ^ a b c d e f g h i j k l m n Brooks, Philip C. (2009). Carpenter, Rhonda (ed.). "Sir Henry's Final Masterpiece Or How Glenn Ford Pushed a Button and Won the War". The International Club for Rolls-Royce & Bentley Owners Desk Diary 2009. Tampa, FL USA: Faircount: 34–41. Retrieved 31 March 2012. ^ a b "Phantom II". Rolls-Royce Owners' Club. Mechanicsburg PA USA: Rolls-Royce Owners' Club. 2011. Archived from the original on 2 April 2012. Retrieved 1 April 2012. The separate gearbox torque-tube drive and cantilever rear springing gave way to the PII's integral engine-gearbox unit, Hotchkiss drive, hypoid-bevel rear axle and semi-elliptic rear springs. ^ a b c Posthumus, Cyril (1977) . The Story of Veteran & Vintage Cars. John Wood, illustrator. Feltham, Middlesex, UK: Hamlyn. p. 115. ISBN 0600391558. This new unit gave notably better performance, delivering the customary Derby 'sufficiency' of silent horsepower via a new unit 4-speed gearbox and a hypoid bevel final drive. ^ a b c Wood, Jonathan (2003) . The Rolls-Royce. Shire Album Series. 198 (2nd ed.). Princes Risborough, Buckinghamshire, UK: Shire Publications. p. 12. ISBN 9780747805779. Retrieved 29 March 2012. ^ "THE EX-MARLENE DIETRICH, MULTIPLE BEST IN SHOW WINNING 1930 Rolls-Royce Phantom". Bonhams. Holmes, Mark (2007). Ultimate Convertibles: Roofless Beauty. London: Kandour. pp. 140–141. ISBN 978-1-905741-62-5. Wikimedia Commons has media related to Rolls-Royce Phantom II.